The 6.7 Magnitude earthquake struck at 01:58 GMT 12/26/03. This was 05:28 am local time. The epicenter was in Bam, a city of 80,000, with 200,000 in the surrounding area, in southern Iran, 620 miles southeast of Teheran. The BBC reported within hours of the quake, "A huge relief operation involving ordinary Iranians, the army, Islamic volunteer groups and local rescue teams is under way." The death toll has been estimated at over 30,000 people with over 30,000 injured. Two hospitals collapsed in the quake and remaining ones were strained to help the thousands injured. Electricity and telephone service were knocked out. Over 70% of the houses in Bam are reported to be destroyed. The quake had been preceeded the night before by a foreshock strong enough to cause some people to sleep out of doors. Undoubtably some lives were saved as people were not inside when houses collapsed. People have continued to sleep outside due to the many aftershocks, which are typical after a major quake. Relief efforts appear to have been well coordinated at the local level. Teams of people were working to dig out survivors soon after the quake. The dead were quickly buried in mass graves. Health and religious authorities both insisted on quick but respectful burials. Although the huge numbers of dead strained resources, this was accomplished. Trenches were dug with backhoes, groups of about 50 bodies were laid in them and covered with dirt by bulldozers. Then a new trench was started and the process repeated over and over again. International aid arrived quickly to help survivors and help with reconstrution. Visa requirements were waived for aid workers and for the first time since the revolution 25 years ago, Americans were welcomed into Iran. There is some hope that this could be an opportunity to improve relations between the two countries. 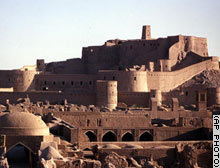 Also destroyed was the Citadel,Arg-e-Bam, mostly dating from the Safavid period in the 16th and 17th C. This was a major historic structure, parts of which date back 2,000 years. As the largest mud brick structure in the world, and a major historic site, it was on the Unesco's list of World Heritage Sites. Bam is on major trade routes to India and the far east, as well as being an oasis in the desert has given it a special importance. The Citadel was a major tourist attraction, the loss of which will be devastating to the nation's cultural heritage and the local economy. Authorities say that it will be reconstructed, but that, of course, is far from the same as having the original. International aid is on the way, with teams from Russia, Turkey and many other nations. Turkey has been especially responsive with aid teams, following devastating earthquakes in 1999, which raised their awareness of the need for quick aid following large quakes. Despite frequent large quakes, Iran does not have strong building codes and many houses are built out of mud bricks and unreinforced masonry, which do not stand up well to earthquakes. Mud brick crumbles into a heavy powder without air pockets. Heavy cement roofs collapsed into houses crushing the occupants. Consequently, casualties and damage is much higher than in a similar quake elsewhere in the world. For example, the Northridge quake in Los Angeles in 1994 was a little stronger than this one but only killed about 100 people. In Kobe Japan in 1995 a similar quake killed about 5,000. There too, heavy tile roofs collapsed into many houses. Other factors contribute to the severity of a quake, but earthquake resistant buildings can make a huge different in the number of injuries. This earthquake occurred as the result of stresses generated by the motion of the Arabian plate northward against the Eurasian plate at a rate of approximately 3 cm/yr (about one inch per year). Deformation of the Earth's crust in response to the plate motion takes place in a broad zone that spans the entire width of Iran and extends into Turkmenistan. Earthquakes occur as the result of both reverse faulting and strike-slip faulting within the zone of deformation. Preliminary analysis of the pattern of seismic-wave radiation from the December 26 earthquake is consistent with the earthquake having been caused by right-lateral strike-slip motion on a north-south oriented fault. The earthquake occurred in a region within which major north-south, right-lateral, strike-slip faults had been previously mapped, and the epicenter lies near the previously mapped, north-south oriented, Bam fault. However, field investigations will be necessary to determine if the earthquake occurred on the Bam fault or on another, possibly not yet mapped, fault. The December 26 earthquake is 100 km south of the destructive earthquakes of June 11, 1981 (magnitude 6.6, approximately 3,000 deaths) and July 28, 1981 (magnitude 7.3, approximately 1,500 deaths). These earthquakes were caused by a combination of reverse-motion and strike-slip motion on the north-south oriented Gowk fault. See the USGS Page on this quake.